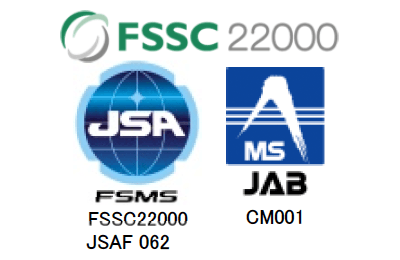 By adhering to FSSC22000 at each step in the production process, from raw material selection to product shipment, we will always deliver products that satisfy our clients. We continuously contribute to the world’s food culture by providing safe and reliable tamari and soy sauce. We provide tamari and soy sauce conforming to laws, regulations, and customers’ requirements for food safety. We enhance both internal and external communication with our clients regarding food safety in order to improve customer satisfaction. High-quality raw materials are carefully selected and procured for our tamari soy sauce and koikuchi soy sauce. Our products are made from non-genetically modified (Non-GMO) soy beans. We have made efforts to reduce waste by asking dairy farmers to use soy sauce lees, which are generated in the production process, as fodder for their livestock, and industrial oil and fat manufacturers to recycle our soybean oil as a raw material for industrial use. Furthermore, we are making efforts to preferentially select materials, work clothes, fixtures, and other items with a low environmental load (green procurement).